Exactly 20 years ago, the East Coast was hit by a huge blizzard similar to what is forecast this weekend. Climate experts immediately blamed it on global warming. Four years later, experts said that children just won’t know what snow is. the warming is so far manifesting itself more in winters which are less cold than in much hotter summers. According to Dr David Viner, a senior research scientist at the climatic research unit (CRU) of the University of East Anglia,within a few years winter snowfall will become “a very rare and exciting event”. Five years later the IPCC said that global warming will reduce cold and heavy snowstorms. In 2008, Robert Kennedy Jr. blamed the demise of snow on Sarah Palin. Residents of McLean, Virginia will be astonished to be under two feet of snow Sunday morning. 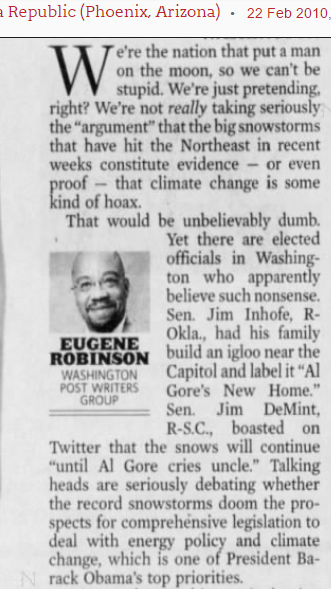 After the 2010 blizzard, progressives became very angry that nature wasn’t cooperating with their scam. Two Saturday’s ago I did my favorite bike ride up the Potomac to Harpers Ferry, West Virginia. They are expecting about two feet of snow this weekend. 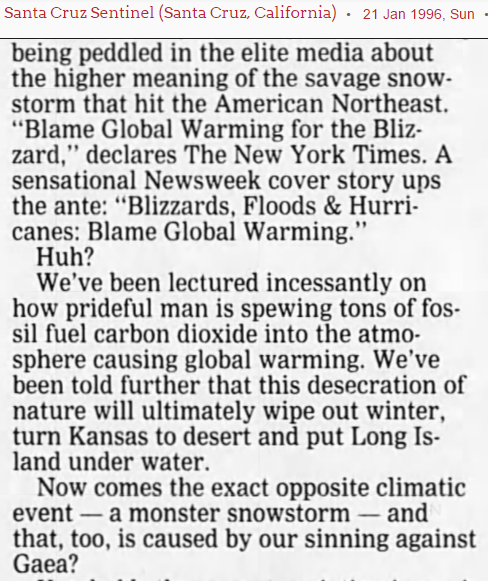 The New York Times and Washington Post will of course blame it on global warming. If they had a repeat of the 1888 blizzard, they would say scientists are 99% certain of the human CO2 footprint. We are truly dealing with the stupidest people who ever lived – also known as climate experts. The “Progressive” movement consists of liars and manipulators that know exactly what they are doing, supported by a large gullible group of people that believe they are the smart ones. It doesn’t matter how stupid the racket is. It works like a charm. It always did. 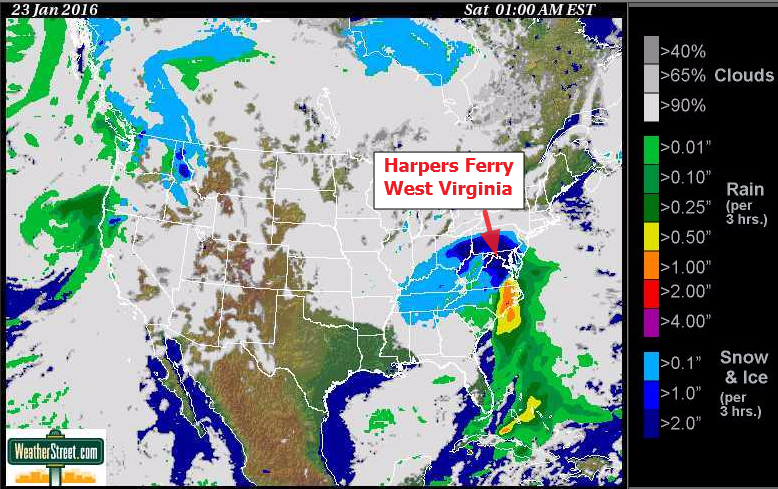 I believe there has been a definite trend for more big snowstorms along the east coast. 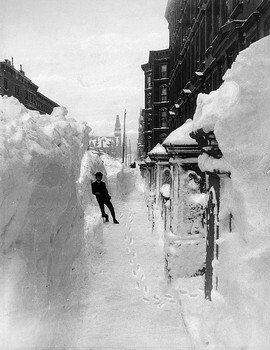 For example in 1958, Boston’s record snowfall over an 80 year period was 16.6″. Since 1958, that old record has been beaten at least a dozen times. Washington, DC had no 15″ snowstorms between 1922 and 1979, but since 1979 has had 6 and is about to get its 7th. What that has to do with global warming, beats me. The BS about warmth causing more snow does not hold water with me, because DC is usually too warm to snow. I have read about the huge snows of the Colonial period, both in the Washington and Boston area. I imagine those were caused by excessive horse farting or George Washington eating too many Mexican beans. In the plants don’t lie but ClimAstrologists do, category. *Impact Freeze: a freeze so severe that it annihilates entire groves across the state, killing both mature and young citrus trees, while causing a profound economic impact on the citrus industry and usually prompting growers to replant farther south. 1894-5 – the freezes of 1894 and 1895 created an *impact freeze situation that devastated citrus growers and rearranged the geography of the Florida citrus industry. 1962 – … The freezing temperatures arrived in Florida on December 12-13, creating the third *impact freeze in the state of Florida. It was considered an *impact freeze because it caused the most damage to trees and fruit of any other 20th century freeze to date. 1977- This freeze created the rare conditions in Florida for snow to stick to the ground. The freeze of 1977 also reinforced and accelerated grower movement south. 1981 – Hard freezing temperatures arrived in Florida on January 12-14. This freeze was comparable to the freeze of 1977. 1983 – This freeze was more severe than the 1977 and 1981 freezes. It occurred on December 24-25 and was so detrimental because the Frost Warning Service missed the forecast…. 1985 – The freeze of 1985 occurred on January 20-22. It was a hard freeze; however, its effects were felt so severely because growers had not yet recovered from the 1983 freeze. The combined effects of the freezes of 1983 and 1985 added up to an *impact freeze situation. There were 13 hard freezes recorded in 180 years. With five hard freezes within 12 years, I doubt the old timer citrus growers think there is Gore Bull Warming. It is just that the data at that web page ended in 1989 and the MSM doesn’t cover cold weather events beyond the local. November 20, 2014 – 141-year-old cold record shattered in Jacksonville Florida. For the second morning in a row, Jacksonville, Florida, dropped to a new record low. The thermometer at Jacksonville International Airport plummeted down to 27°F (-2.8 C) on Wednesday morning, breaking the old record of 28°F set in 2008. Thursday morning’s temperature dropped to a bone chilling 24°F (-4.5 C) breaking the old record of 30°F (-1.1 C)set in 1873. Thursday’s 24°F also marks the second lowest temperature ever recorded in the entire month of November. In January 2010, parts of Florida were hit with an historic cold wave, the coldest since records began in 1873. With temperatures hovering around the freezing point, the cold destroyed millions of dollars of crops and killed at least two people. Florida waters were a full 14 degrees F (8 C) below normal. Centuries-old coral wiped out by record cold. “Some of the hardest hit corals were from the genus Montastraea — large, boulder-size corals. Many colonies were centuries old. In the beginning of January 2014 a historic and deadly freeze locked almost the entire United States under subfreezing temperatures Tuesday, closing schools, delaying trains and buses, and forcing cancellation of more than 9,000 flights. Single-digit (Fahrenheit) temperatures (-18 to -13 C) were recorded as far south as Georgia and Alabama. A 118-year-old record fell in Central Park in New York, where it was 5 F (-15 C), the coldest ever for Jan. 7. Temperature records were shattered in many states, including Alabama, Georgia, Tennessee, Arkansas, Michigan, Maryland, Ohio, Pennsylvania and New York. It got so cold that a Chicago zoo had to move its polar bear and penguins inside. Hard freeze warnings for Tuesday extended all the way south to the Gulf Coast. In fact, freezing temperatures reached as far south as Florida, said Brian Korty, a National Weather Service meteorologist. There was quite a bit of power loss too. The east coast got slammed again a few weeks later. The Deep South hunkered down on Tuesday for what could be its worst snow and ice in a generation, stretching from Texas to the Carolinas. In New Bern, North Carolina, where the last 6-inch snowfall happened in 1989, got as much as 7 inches. Schools were closed from Texas through the Florida Panhandle and up to North Carolina. The Johnson Space Center in Houston shut down for the day. And at the end of March (March 27, 2014) Toledo, Ohio, broke a 120-year-old record. The low of 9F (-12.8C) broke the previous record of 11 F (-11.7C) set in 1894. In Detroit, Michigan, the record low of 11 F for March 26 was tied. In Macon, Georgia, the low of 26 F (-3.3C) broke the old record set most recently in 2006. Freezing temperatures dipped into the Deep South Wednesday morning, including Mississippi, Alabama, Georgia, South Carolina and northern Florida. January 2015 saw a couple of cold waves bringing Florida to at or below freezing. On January 10, 2015, “Snow danced over the streets of Jacksonville Thursday for the first time in five years and tied the record for the day of a trace set 57 years ago,” says News4jax.com. On February 20, 2015 Jacksonville, Florida at 24 F again broke the record for cold. “Some locations in the Northeast are challenging their coldest February on record,” says AccuWeather.com Senior Meteorologist Joe Lundberg. My mother lives in a part of Florida that had huge commercial orange groves until 1989. They still get freezes (mom gets lows in the teens at least once a year now), but since there are no orange groves anymore, it is not reported. Those freezes in the 1980’s were unusually severe, literally wiped out the groves north of Orlando. Believe it or not, I used to dabble in orange juice futures and made a fair amount of money from them. Since the groves have moved south, it is not as easy as it used to be. Gail, and especially Gator…you guys will get a kick out of this.. I am not that surprised. I am in mid NC (Piedmont) and we rarely get snow. So there were decades when the coastal areas were warm enough in SC and Georgia. The Progressive/Socialist/Marxist/Communist/Liberal philosophy is amoral, not immoral. Thus they can through a twisted perverted form of logic be 100% convinced that whatever they are saying at the moment is the absolute truth. Slick Willie, Mrs. Clinton, Algore, Hussein, Fidel Castro, Adolf Hitler, Frank Roosevelt, et al, were/are the most honest people who have ever walked the earth. They are by definition incapable of lying. The path. You must follow the one true path or you get nothing but reactionary lies. “The sole conclusion to be drawn from the opinion of the Marxists [on] Marx’s theory” is that the sociopathic politicos have been deliberately gaslighting the Middle Class for decades in order to render them insane enough to actually want a return to serfdom. If this were little league baseball, the gaslighting would have been ended by the mercy rule, decades ago. The return to serfdom you speak of came in 1971, when Nixon decreed that the government could arbitrarily redefine the value of the money in your pocket. Arguably, that date could be pushed back to 1933. If thoughts can be read, you can be damned well sure they can be written. And keep in mind, this is only what they’re admitting to. I’d guess we have about 20-30 years left before this technology really matures. If these brain chips are the next step in the cell phone craze, then it’s game over. If they find a way to do this remotely, it’s game over. This technology is the end of free will. Disobedience will become literally unthinkable. In the foreseeable future, it will no longer be enough to love Big Brother. We’ll be asked, then eventually forced, to invite him in to our thoughts. If you’re not THINKING anything wrong, then what are you afraid of? That’s why I’m rooting for a total economic collapse. I’d rather see us return to the dark ages, than live out what certain parts of the ruling class are openly planning for us. Actually Ted it was 1913. 1933 was the result of the actions made in 1913 and 1915. 1. 1913 Federal Reserve Act made American citizens responsible for the international loans made by bankers using Fractional Reserve Banking. 2. 16th Amendment allows Congress to levy a direct income tax on the public. 3. 17th Amendment moved the election of the Senate from the control of the states to popular vote. This got rid of the states check on the grow of the federal government. 4. In 1915 J.P Morgan and his buddies in the war munitions business bought up controlling interest in the major newspapers to move the country from isolationism to ‘World Policeman’ The ads by Germany notifying Americans that the Lusitania was carrying munitions and would be bombed were censored til the last minute to make sure American lives were lost and the outrage would flip the USA into World War I.
inserted their own editors, in order to control the media. And yeah, we do need to have a major reset in thinking. You may be correct. A new Dark Age would be better. The work is being carried out at Duke University. Totally right about 1913. I was only referring to gold convertibility, at that point. But yes, the silent coup of 1913 was more devastating, overall. Throw in Wickard v. Filburn, the war of northern aggression, and Marbury v. Madison, which set the stage for everything that’s followed, and you start to see a pattern. About once every generation, we gat a major new step toward totalitarianism. The patriot act, and all it’s demon spawn, was the most recent. I think the next will be banning cash, probably in 5-10 years. I’d forgotten about the spermicidal corn. Drudge has run a bunch of stories about human genetic engineering lately, too. Oh, the joys of modern science. All this stuff just makes me wonder if we really are the first global civilization on this planet. We’ve been here for at least 50,000 years. The Neanderthals, who were arguably more intelligent than us, were around for at least a quarter million years. It seems very possible that we’ve hit the reset button a few times in all those years, whether on purpose or by accident. Ted was a bit of a try at getting rid of cash in Obamacare. Originally ObamaCare required small business owners to file an additional 1099 form with every other business that they did more than $600 in transactions with. IF the transaction was made with a credit card it was exempt from reporting. It was aimed at cash sales between businesses. Think of motels, hotels, gas stations, Home Depot, Lowes, Sam’s Club, Costco, Staples, Office Max and the MILLIONS of additional reporting that would be necessary…. The other ramification of Obamacare is micro-chipping patients. No Chip no medical care…. I think the economic collapse is coming; in fact it has started. I truly wish they were stupid, but alas, I don’t think they are. There motivations are far worse: cupidity trumps stupidity, and political propensity outweights mental density. It is almost funny to count how many lies can be fit into one article. Third coldest NFL game in history didn’t get much publicity in the UK! I suppose “global warming” was the reason it wasn’t the coldest. (more CO2) => (solar energy in) > (energy radiated) => (planet warms). Ultimately it’s simple, and there really is no doubt it’s happening. It’s hard to understand why that is so difficult to accept…sigh. No, it really is not simple. Anyone who thinks it is simple is like the first grade student who thinks that all math is simple because teacher told him about subtraction and the process made sense to him. Pardon the snark — but if anyone tells you that anything about global climate is simple, then be aware that they do not know much about climate. John C , it ain’t simple dude. ClimAstrologists treat the sun’s energy as constant. Since they use TSI (Total Solar Insolation) instead of looking at the variation in different wavelengths they completely blow it. An example of JUST ONE aspect of our variable sun affecting climate. Because of selective absorption and scattering processes in the Earth’s atmosphere, different regions of the solar spectrum affect Earth’s climate in distinct ways. Approximately 20-25% of the Total Solar Irradiance (TSI) is absorbed by atmospheric water vapor, clouds, and ozone, by processes that are strongly wavelength dependent. Ultraviolet radiation at wavelengths below 300 nm is completely absorbed by the Earth’s atmosphere and contributes the dominant energy source in the stratosphere and thermosphere, establishing the upper atmosphere’s temperature, structure, composition, and dynamics. Even small variations in the Sun’s radiation at these short wavelengths will lead to corresponding changes in atmospheric chemistry. Radiation at the longer visible and infrared wavelengths penetrates into the lower atmosphere, where the portion not reflected is partitioned between the troposphere and the Earth’s surface, and becomes a dominant term in the global energy balance and an essential determinant of atmospheric stability and convection. The graph above shows total ozone and stratospheric temperatures over the Arctic since 1979. Changes in ozone amounts are closely linked to temperature, with colder temperatures resulting in more polar stratospheric clouds and lower ozone levels. Atmospheric motions drive the year-to-year temperature changes. The Arctic stratosphere cooled slightly since 1979, but scientists are currently unsure of the cause…. Ozone is an important atmospheric trace constituent. The depletion of solar radiation between approximately 2000 and 3000 A is the result of strong absorption by ozone in the ultraviolet wave-lengths. The energy absorbed in this process is the prime source of thermal energy in the stratosphere. Because of this, ozone plays an important role in the large-scale motions of the atmosphere…. ….A strong correlation was found between the meridional gradient of total ozone and the wind velocity in jet stream systems….. The total column ozone (TCO) observed from satellites and assimilated in the European Centre for Medium-Range Weather Forecasts since 1979 is used as an atmospheric tracer to study the modulations of the winter Arctic stratosphere by the quasi-biennial oscillation (QBO) and the solar cycle. It is found that both the QBO and solar forcings in low latitudes can perturb the late winter polar vortex, likely via planetary wave divergence, causing an early breakdown of the vortex in the form of sudden stratospheric warming. As a result, TCO within the vortex in late winter can increase by ~60 Dobson unit during either a solar maximum or an easterly phase of the QBO, or both, relative to the least perturbed state when the solar cycle is minimum and the QBO is in the westerly phase. In addition, from the solar maximum to the solar minimum during the QBO easterly phase, the change in TCO is found to be statistically insignificant. Therefore, the “reversal” of the Holton–Tan effect, reported in some previous studies using lower stratospheric temperature, is not evident in the TCO behavior of both observation and assimilation. Compared to well-mixed greenhouse gases (GHGs), the radiative forcing of climate due to observed stratospheric ozone loss is very small: in spite of this, recent trends in stratospheric ozone have caused profound changes in the Southern Hemisphere (SH) climate system, primarily by altering the tropospheric midlatitude jet, which is commonly described as a change in the Southern Annular Mode. Ozone depletion in the late twentieth century was the primary driver of the observed poleward shift of the jet during summer, which has been linked to changes in tropospheric and surface temperatures, clouds and cloud radiative effects, and precipitation at both middle and low latitudes. It is emphasized, however, that not all aspects of the SH climate response to stratospheric ozone forcing can be understood in terms of changes in the midlatitude jet. The response of the Southern Ocean and sea ice to ozone depletion is currently a matter of debate. …. The climate morons want is to believe that man altered the global climate 7000 years ago via farming. It is astounding what group hysteria breeds. …According to the supporters of the genetic bottleneck theory, between 50,000 and 100,000 years ago, human population suffered a severe population decrease—only 3,000 to 10,000 individuals survived—followed eventually by rapid population increase, innovation, progress and migration. Evolutionary biologist Richard Dawkins has postulated that human mitochondrial DNA (inherited only from one’s mother) and Y chromosome DNA (from one’s father) show coalescence at around 140,000 and 60,000 years ago respectively. In other words, all living humans’ female line ancestry trace back to a single female (Mitochondrial Eve) at around 140,000 years ago. Via the male line, all humans can trace their ancestry back to a single male (Y-chromosomal Adam) at 60,000 to 90,000 years ago. Climate experts are almost as funny as Bill Cosby, and as talented as Rolf Harris. Both of whom will do some serious time. Seems Rolf Harris is putting his talent to use and his guards were NOT amused. I wonder who Bill Cosby ticked off? The elite are very good at burying crimes up to and including murder so for this to come out now means Cosby made a misstep. I was wondering about Cosby’s stand on CAGW (didn’t find anything but a rumor) and found this instead. National Report The latest Obama Executive Order issued to EPA Secretary Gina McCarthy calls for “corking” Old Faithful Geyser to reduce the effects of climate change. ….Splitting hairs aside, this bold move by Obama comes at a time when the president is displaying a “take no prisoners” attitude as his second term comes to a close. As of June 2015, his approval rating topped 50%, the highest in over two years. Reaction from The Sierra Club and other prominent environmental groups is hotly anticipated. National Report is America’s #1 independent news source. Where the ” lamestream” media leaves off, we pickup. I have been expecting Bill Cosby to be hit with some kind of scandal. He had become rather vocal about about on-going problems in the black community. The left was gunning for him because he threatened the victim-hood of African Americans. Thanks Jason, I figured as much. The left holds the unquestionable moral high ground. It’s sad that you would try to demean the integrity of such fine, upstanding criminals. Except that climate experts molest data, not women and children. Cosby and Harris could easily get of scot free, just by saying they are muslims. !! five to six feet of snow like Buffalo got. Thank God I’ll soon be moving to a more snow-shoveling friendly state. GOOD GRIEF! That is totally absurd. Back during the late 1970s when Rochester NY got hit with major snow storms, I went around with a shovel on my cross country skis to help the older folk dig out. The last thing I wanted was a neighbor dropping dead of a heart attack because no one helped. It is becoming clear that our abusive Uncle Sam does not want kids to have jobs. It is so much easier to control those who have grown up never knowing responsibility or self worth. Not only kids but anyone. Gone are the jobs like lawn mowing, gardening, baby sitting, house cleaning, taking in laundry, sewing/tailoring, ironing… The change in tax codes making the ’employer’ have to file 1099s killed the domestic help/home service business. Heck you can’t even sell lemonade at a kiddie lemonade stand or have a homemade pie sale for church. If the regulations and tax laws don’t kill you the darn insurance companies will. A friend had a one man office cleaning service. Another had a hack stable & hay ride business The insurance companies hiked the premiums and put both out of business. With my small business the first Insurance company I had wanted to know my gross revenue and then took 10% of the gross. In many companies, especially start-ups 10% is your net profit… IF you are lucky!